Bomb Plants are a special type of Bob-Omb/vegetable hybrid that grow underground. They are seen only in a few episodes The Super Mario Bros. Super Show!, and are inspired by the vegetables and the bombs and Bob-Ombs that can be plucked from the ground in Super Mario Bros. 2. 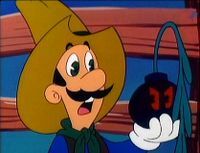 Bomb Plants appear in several episodes of The Super Mario Bros. Super Show!, where they are depicted as limbless Bob-Ombs with long leaves. However, unlike normal Bob-Ombs, Bomb Plants are not shown to have control over their explosions. Even after being plucked out of the ground, the fuse of a Bomb Plant does not go off automatically; instead, one must tear its leaves out from the main body to trigger the fuse, much like pulling the pin from a grenade. This page was last edited on March 20, 2019, at 20:18.